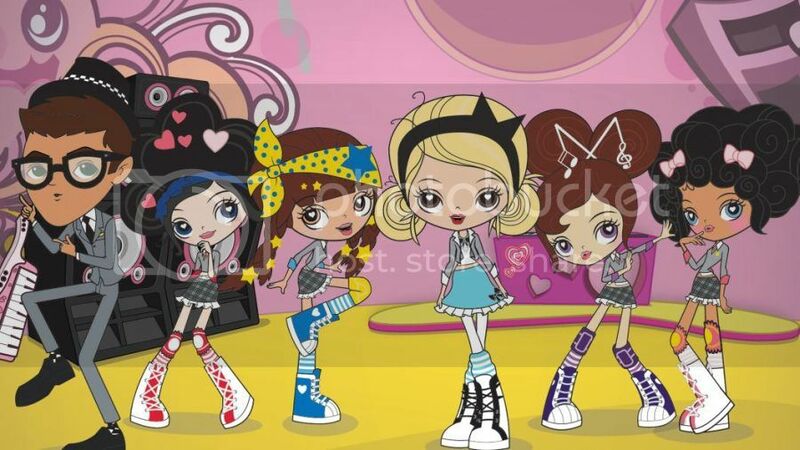 For all fans of music and fashion there is an amazing animated series created and produced by Gwen Stefani called Kuu Kuu Harajuku. The series is about five girls and their journey in the musical world, ups and downs, interesting encounters, songs and performances. The 2D-animated series currently airs on Family Channel in Canada and on Nickelodeon in the U.S.
Today animated series Kuu Kuu Harajuku is available on DVD in North America from Shout! Factory in collaboration with DHX Media. The first issue, Kuu Kuu Harajuku Music, Baby!, contains 14 episodes from Season One. Initial shipments of the DVD contain a code to download the Kuu Kuu Harajuku theme song (while supplies last). Kuu Kuu Harajuku Music, Baby! is available now on Amazon and ShoutFactory.com. Gwen Stefani’s Kuu Kuu Harajuku follows the fun-filled adventures of the band HJ5 – Love, Angel, Music, Baby and G – through their super kawaii (cute) world of music, fashion and style. The inspiration for this popular animated series came from Grammy® Award-winning musician Stefani who wanted to create an animated series for girls that encourages and celebrates creative self-expression, imagination and individuality. The series is filled with great songs and lovely music stylish girls love to sing and play. Every girl the band HJ5 has unique style in singing, clothes and accessories they wear. Though they are cute, Love, Angel, Music, Baby and G are strong enough to handle what their active life brings them every day. They may not win all the competitions but they love music and make great team!!! We are excited to giveaway two copies of Kuu Kuu Harajuku Music, Baby! to our lucky US and Canadian readers thanks to Shout!Factory. Simply fill the form below and Good Luck! The giveaway ends July 1st, 2017! I'd like this DVD for our family. I would love to win this DVD for my granddaughter who would enjoy it very much. My kids would love it so they hope i win. I'd like to win this for my niece's little girls. I would love to win this DVD for my granddaughter.Thanks for the chance. I would love to win this DVD for my niece, she has a 4 year old daughter, 2 year old son and another daughter that was born 2 days ago, I know that they would all enjoy it. I think my granddaughter would really enjoy this DVD! I would like to win this for me. I collect Gwen Stefani purses. I have at least 30 of her Harajuku lovers bags. I want to win this for my nephew! Thanks for the chance to win! I'd like it for the kids at the library. I would like to win this for my grandchildren. Thanks!